This statue was built in 1993, located at the centre of road intersection at the northeast ogf Bali International Airport. In Mahabarata story Gatotkaca is despicted as a very brave and powerful knight, the son of Bima one of the ﬁve Pandawa brothers. He is identiﬁed as ﬂying knight who is responsible for air defense and security protection for the Pandawa Kingdom. The erection of the statue apart from as an effort to beautify the landscape around the airport. It is also believe could contribute spiritual protection and safety for all incoming and outgoing, ﬂights. 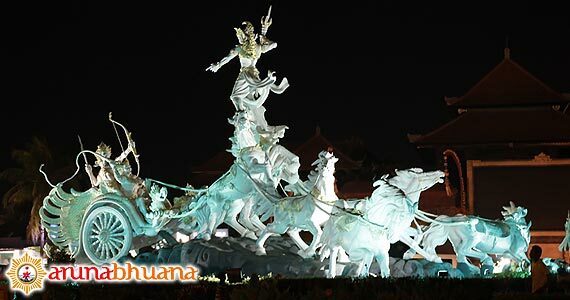 This statue enable to present a very striking view and excellent for taking picture when you arrive in or leave Bali.